Aerospace engineering Professor of Practice Marshall Kaplan was recently awarded a U.S. patent for “Apparatus and Methods for Orbital Debris Removal.” With the ever-increasing concern over the volume of debris in orbit around earth, there has been a growing number of approaches for tackling the orbital debris problem. Kaplan, who is the associate director for the University of Maryland’s Center for Orbital Debris Education and Research recently proposed a new type of deployable interception vehicle capable of both intercepting debris, being maneuverable to avoid active satellites, and capable of being deployed in numbers. 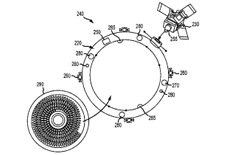 According to the patent, Kaplan’s orbital debris interception vehicle includes a satellite bus with a coupled debris interception module capable of being deployed separate from the main vehicle. The debris interception module includes a debris impact pad, such as a pancake-shaped Whipple shield, which is a type of hypervelocity impact shield used to protect spacecraft from collisions with micrometeoroids and orbital debris. Kaplan’s proposed vehicles could be deployed in numbers into an equatorial orbit and maneuvered to his satellite bus could release its debris interception module before an intercept and then reconnect after interception. In addition, Kaplan estimates that the apparatus and methods described in his patent will cost no more than about 1% of other possible options for the cleanup and maintenance of the near-Earth high-density debris field.